Kauto Star proved he is still the best chaser in the land as he bounced back to his brilliant best to win the Betfair Chase at Haydock for a second successive year. Travelling sweetly for new jockey Sam Thomas, a huge leap at the third-last took him clear of My Way De Solzen. Exotic Dancer, who chased home Kauto Star in the Gold Cup at Cheltenham, emerged as a real threat after the last, but Paul Nicholls' star (4-5 favourite) showed real grit and determination to win by half a length. “I could shoot that Kauto Star!” was trainer Jonjo O’Neill’s reaction after Exotic Dancer was beaten half a length by Kauto Star. This is the third time the seven-year-old has finished runner-up to the same rival, having also chased him home in the Stan James King George VI Chase and the totesport Cheltenham Gold Cup last season. O’Neill’s continued: “The winner is a right horse, isn’t he? “Exotic Dancer has run a blinder. I could only be more pleased if he had won! You can’t be disappointed really. “I think he will probably go for the King George now. A further 18 lengths back in third was Beef Or Salmon and his trainer Michael Hourigan was delighted too. He said: “Beef Or Salmon hadn’t run since April and Denis (O’Regan, jockey) said he really needed it today. “I thought halfway round when I saw how he was travelling that I would have to make a statement announcing his retirement! He then picked up and stayed on really well. 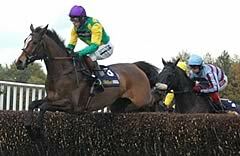 “He will go for the Lexus Chase at the Leopardstown’s Christmas meeting now. The fourth horse home was Turpin Green, another 16 lengths back. His trainer Nicky Richards said: “Turpin Green ran OK.
“He hates that ground and hadn’t had a prep run. “We will look at the King George and the Lexus Chase for him now and we may also consider the Long Walk Hurdle at Ascot. Alan King was taking My Way De Solzen’s fifth place in the Betfair Chase firmly on his own shoulders. He said: “I am very disappointed with myself as he was unfit. He was blowing for 35 minutes after the race and was very tired. Dickon White, Managing Director at Haydock Park, was very satisfied after the first day of the Northwest Racing Masters and Kauto Star’s victory in the Betfair Chase. He said: “Everyone at Haydock Park today was privileged to see another superb effort from Kauto Star as he won his second Betfair Chase. “The Betfair Chase field consisted of the very best chasers from Britain and Ireland and Kauto Star demonstrated once again he was at the top of the tree. “The racing throughout the day has been highly competitive and seen some superb performances. Jockey Sam Thomas will certainly not forget today.